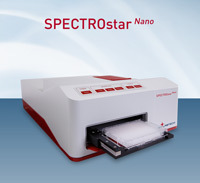 The SPECTROstar Nano represents a revolution in absorbance measurement instrumentation with the flexibility to perform assays quickly and easily in both microplates or via the built-in cuvette port. Using a spectrometer, this new absorbance microplate reader captures a full UV-Visible spectrum (220 to 1000 nm) in less than 1 sec/well and measures sample volumes down to 2 µL. The speed of the spectrometer, simple push button operation, and the capacity to design and save individual assay protocols give users an unmatched flexibility to optimize settings for all absorbance experiments. Low volume 2 µL measurements for DNA, RNA, protein, etc. The SPECTROstar Nano is delivered with a new version of BMG LABTECH's established Reader Control software and comprehensive Data Analysis Software, MARS. With its simple to use 'Quick Run' feature it reads ELISAs, RNA, DNA, Protein (Bradford, BCA, Lowry), Cell growth, and Beta-galactosidase assays at the touch of a button due to predefined protocols. This highly intuitive software also provides limitless possibilities for test set up where it is needed. In MARS, a wizard guides the user through the entire data analysing process. Additionally, a template manager can be used for building complex data processing protocols. Improved robotic integration capabilities, digital signature and FDA 21 CFR part 11 compliance of MARS complete this powerful software package.